Noel, Michael, Joe, Paul and Mark. 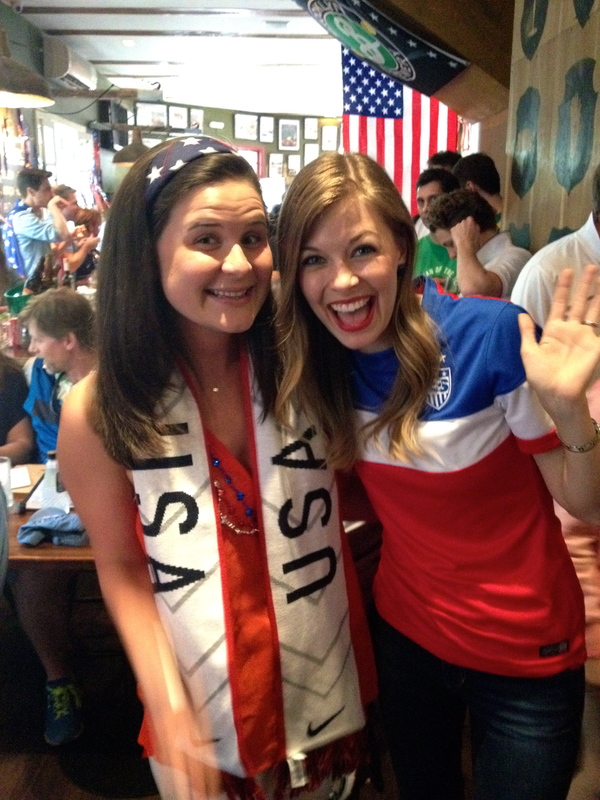 Crazy bumping into Hillary – a friend from McCain ’08 – in town for the World Cup! 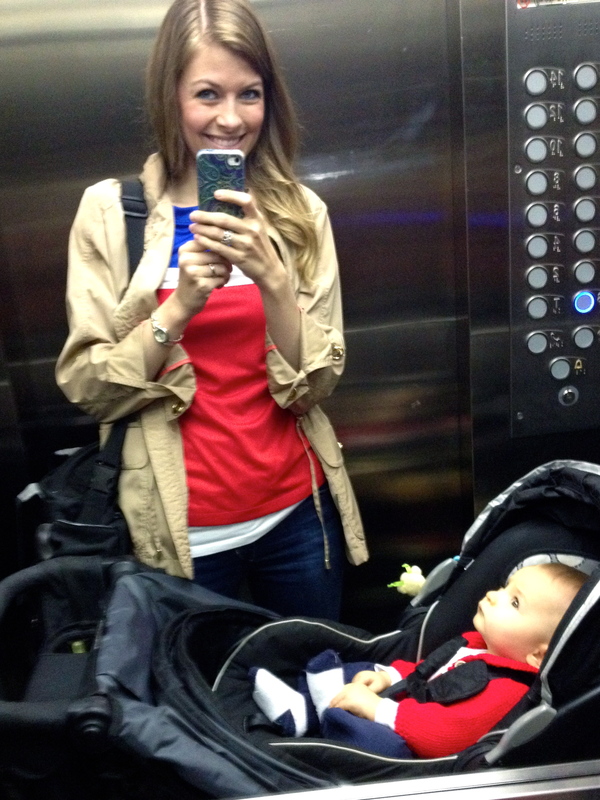 The next day, Michael and I packed our bags & our baby and headed with Joe and Jake to Belo Horizonte for the weekend where we would get to watch Brazil play Chile in their first match in the knock-out phase. We rented an apartment for the weekend and through friends of friends were lucky enough to find a babysitter to watch Colt all day while we enjoyed a full Saturday focused on the game. About to head out to the game! Colt clearly doesn’t get what a big day this is. Nor is he dressed appropriately. 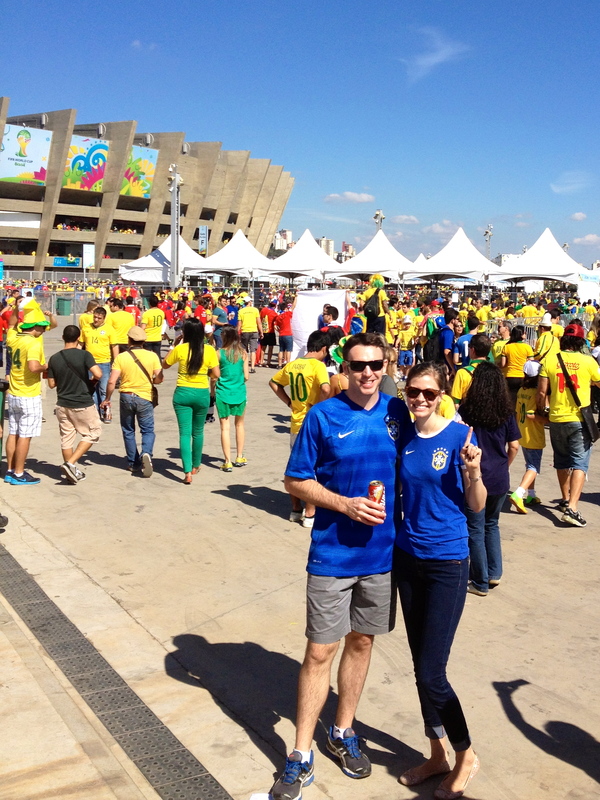 We were dropped off about 1.5 miles from the stadium where we then walked along a sea of yellow jerseys until we arrived at the Mineirão. 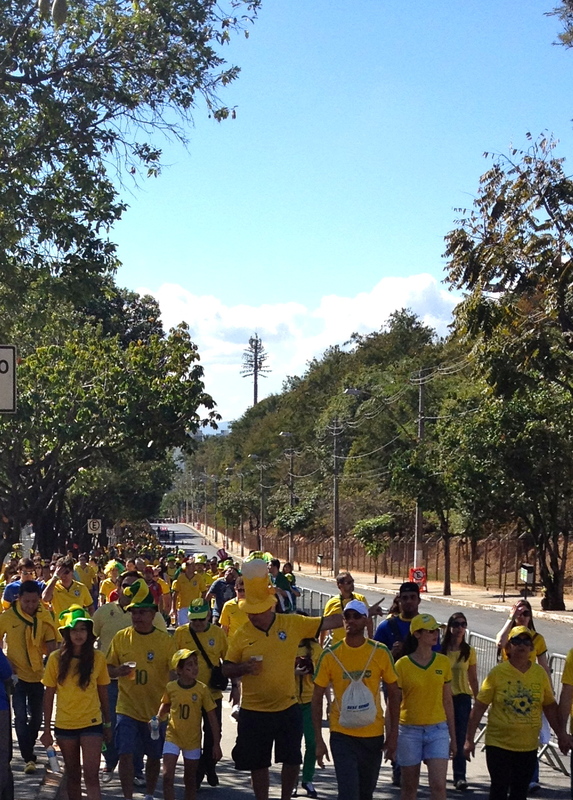 The walk to the stadium. 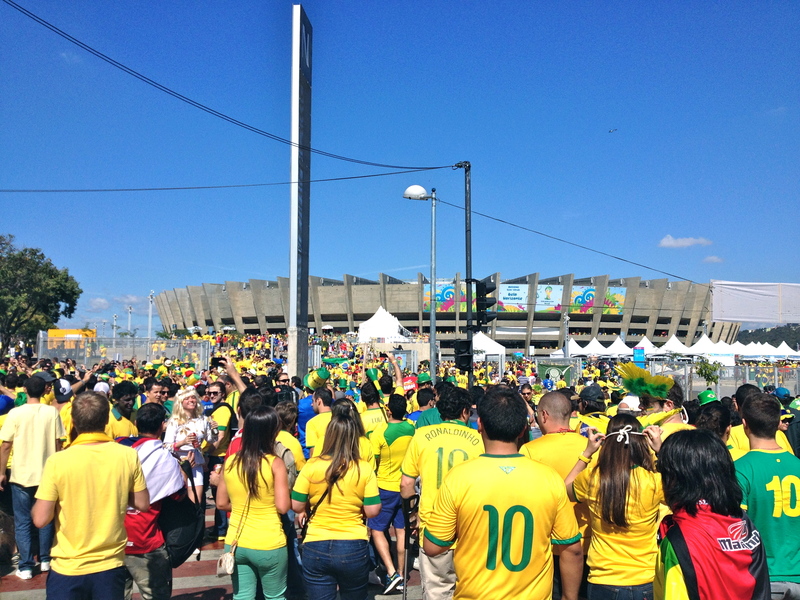 The walk to the stadium was pretty fun – full of ice-cold beers and lots of Brazil chants – everyone was in the spirit. And the enthusiasm only grew as we arrived at the Minerão. 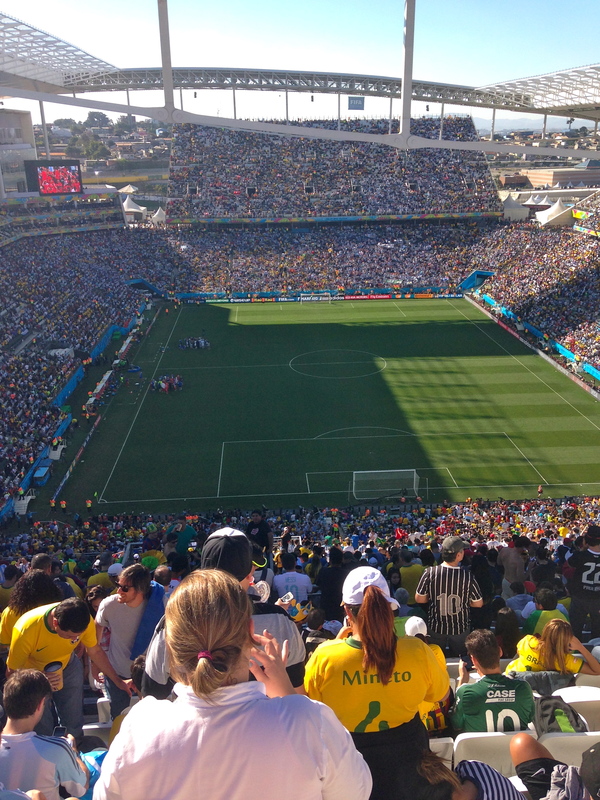 I couldn’t believe that the first World Cup game I was attending was one with Brazil playing! 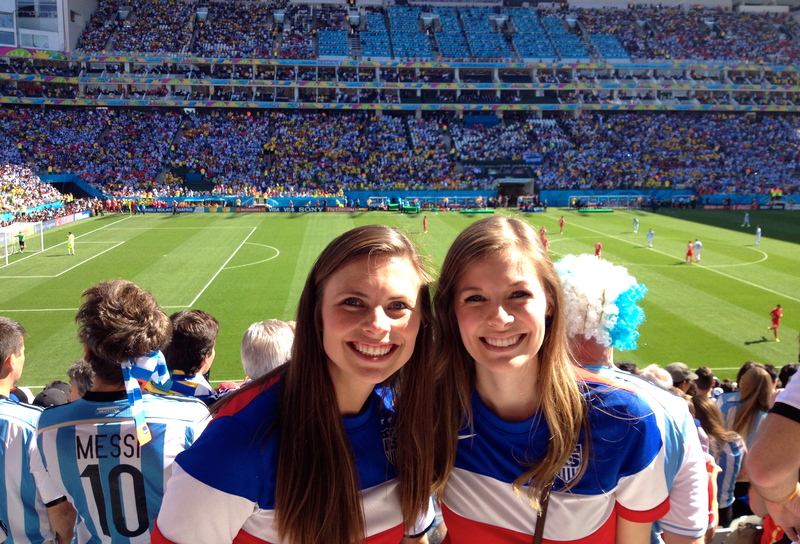 We arrived at the stadium about an hour and a half early, so after walking around a bit, we went to find our seats. Since you buy tickets through a lottery system, you never really know what your seats are going to be like, but we totally lucked out with these. I really can’t describe what the game was like. The entire thing was amazing. 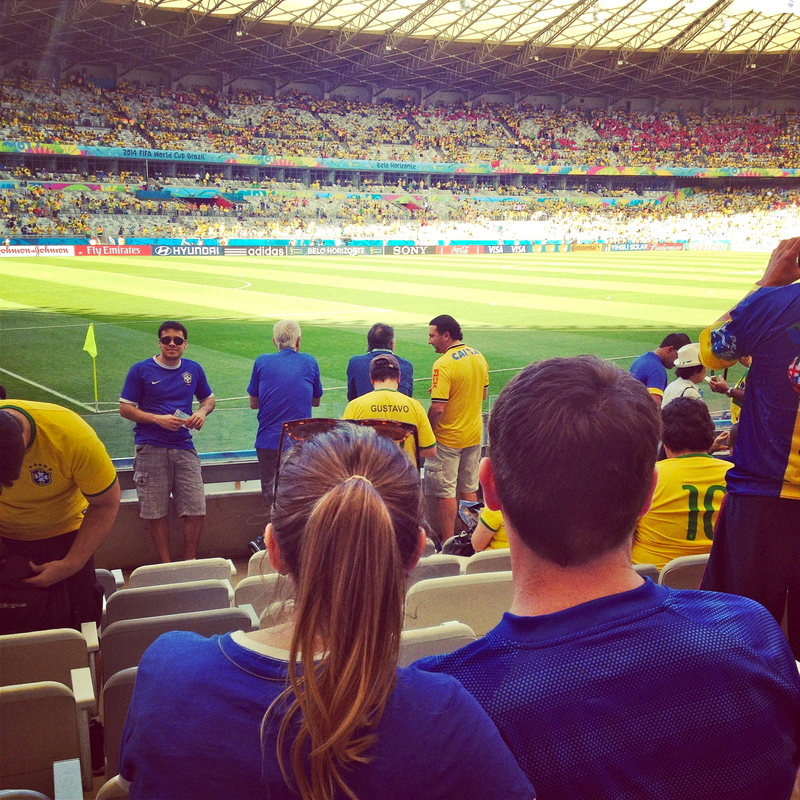 Brazil’s first goal was right in front of us and the whole place went nuts. But when we headed into extra time and then penalties, the entire stadium was so packed with intensity I thought it was going to burst. The man behind us said that his heart was not prepared for PKs and literally walked out before they started, unable to handle the crazy pressure of the moment. 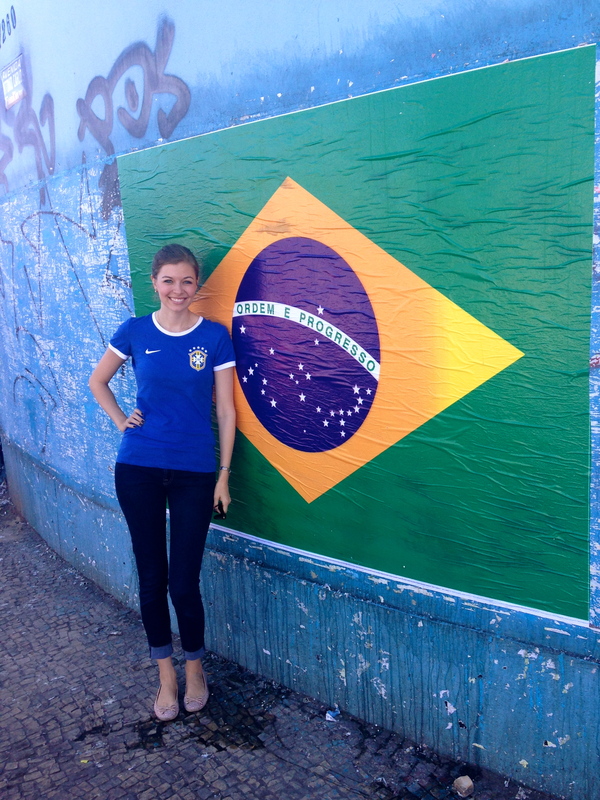 It was something I’ll never forget and for Brazil to walk away with the win was sweet icing on the cake. 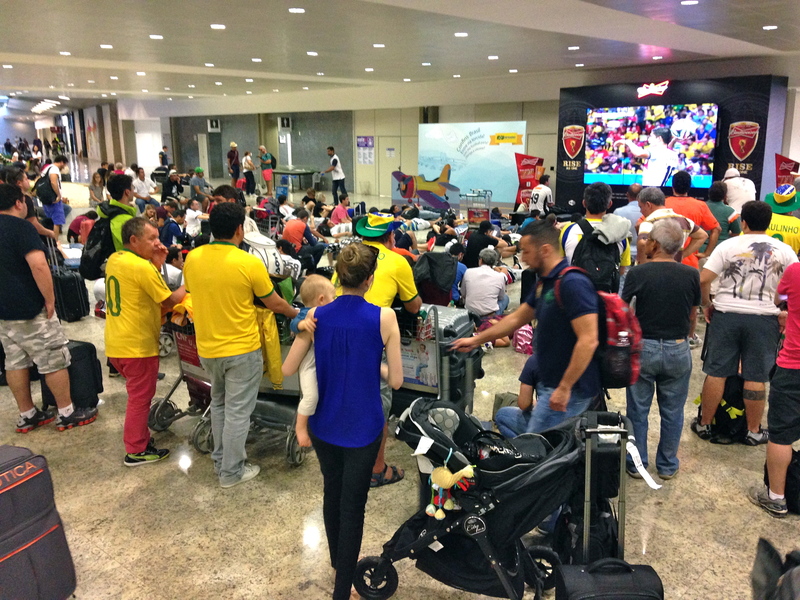 Everyone crowded around the TV in the airport to keep watching the games. Sweet Colt, an amazing traveler and great sport during all of the chaos. 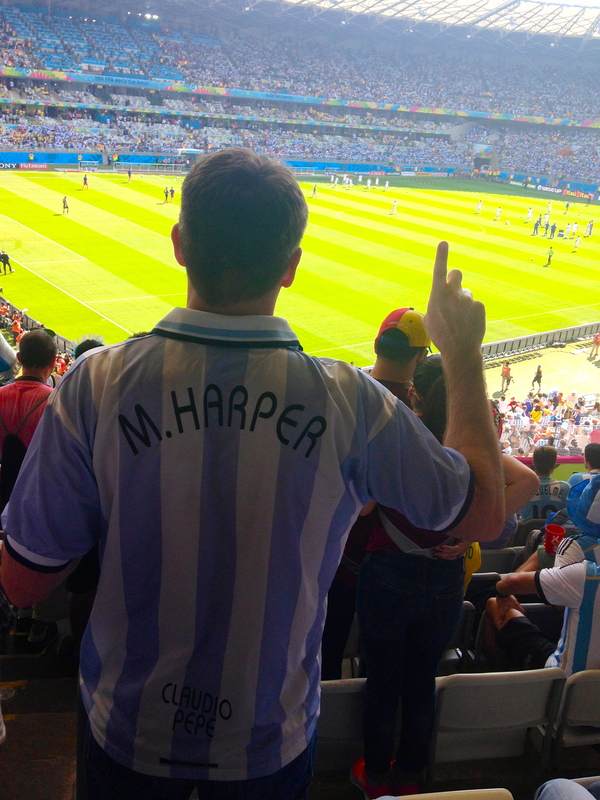 The day after we returned from Belo Horizonte, Michael and I both landed unexpected tickets to Tuesday’s Argentina v Switzerland game in São Paulo. 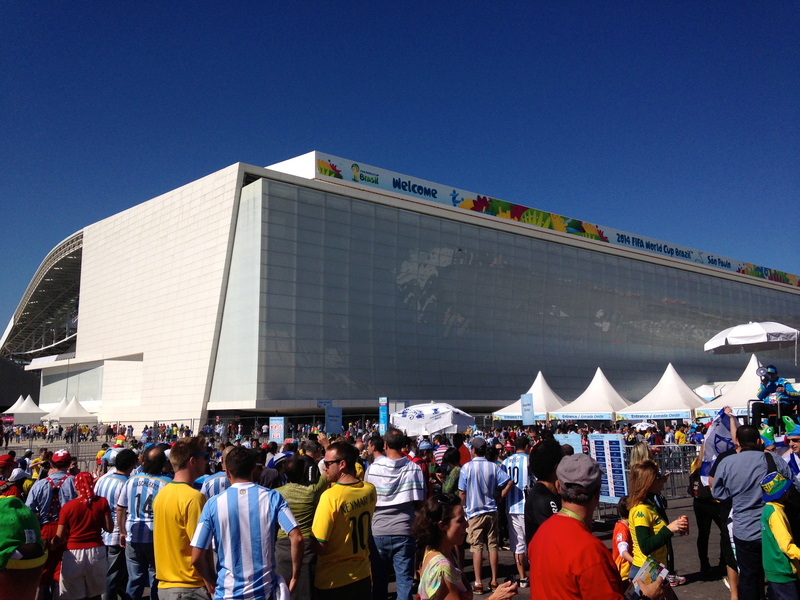 I was so pumped to get to see Argentina play AND get to see the brand new stadium in São Paulo. The game was funny because it was filled with Brazilians who did nothing but cheer against Argentina and Argentines who did nothing but cheer against Brazil! This would make sense if Argentina had been playing Brazil, but they were playing Switzerland! 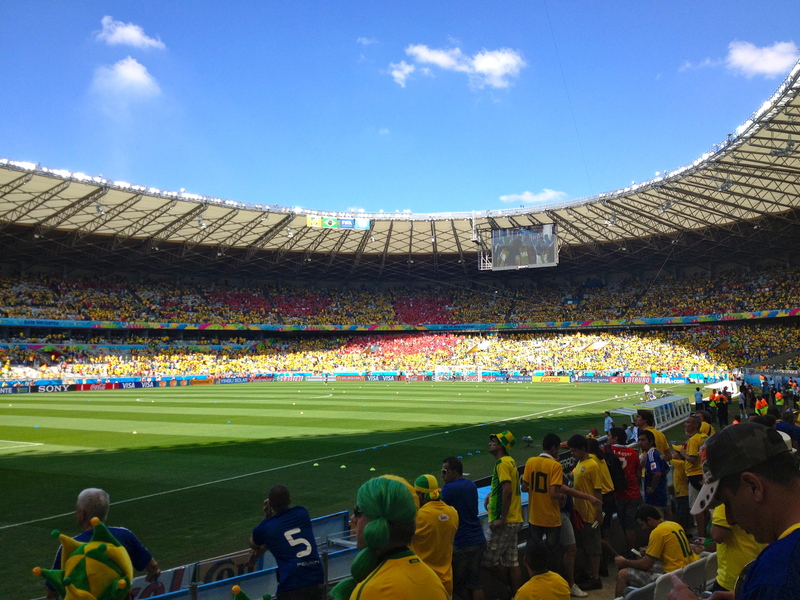 Regardless, the rivalry between Brazil and Argentina – especially when it comes to soccer – is so strong, that the two countries just cheered and chanted against each other the whole time! I was originally cheering for Argentina but I found that I could never join in any of their chants because they were rarely related to the game but instead were all just negative about Brazil! Too funny. 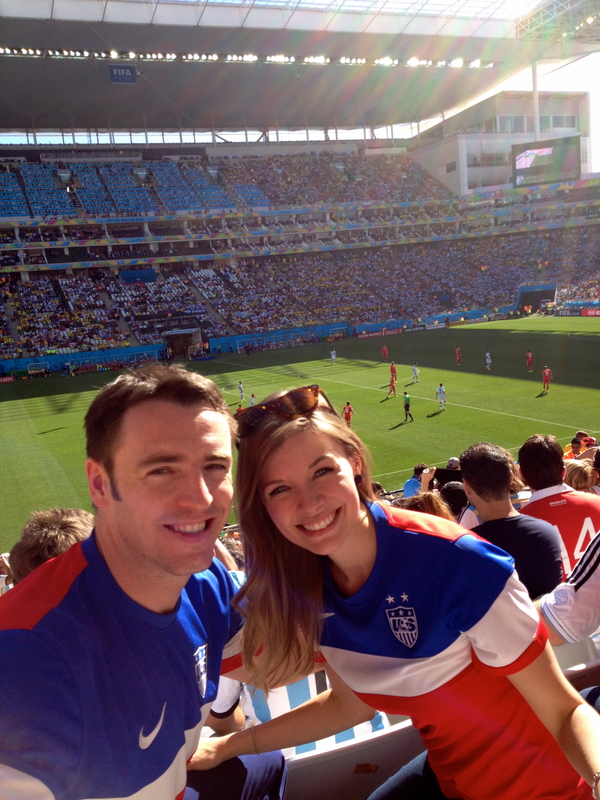 Thankfully we were wearing our USA gear in prep for our game later that afternoon, so we didn’t upset any Brazilians. Great seats again! With Michael. 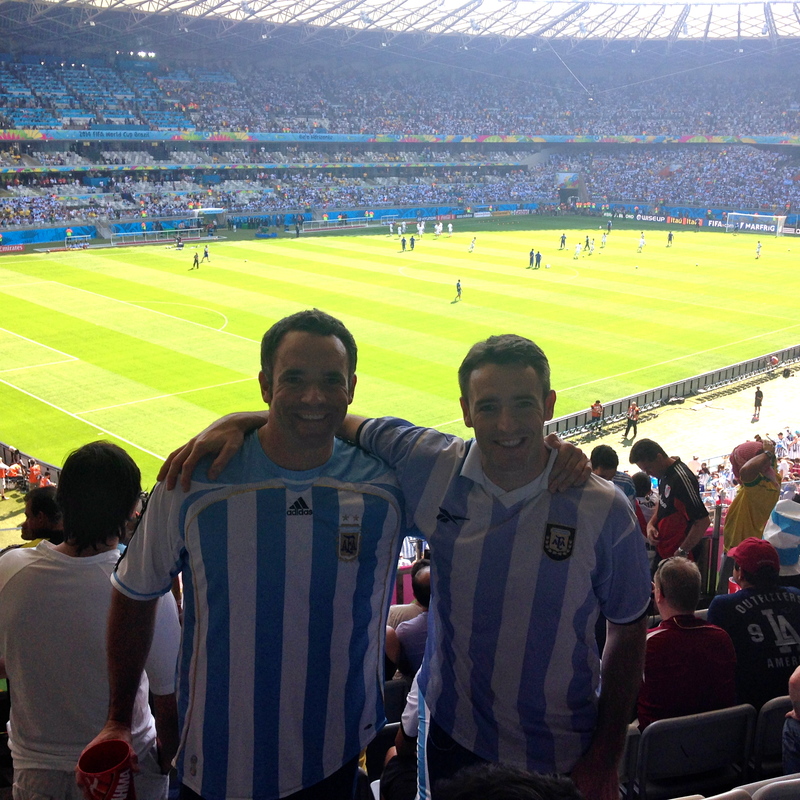 The sad part of this story is that we all left the game a little early to get back to BOS in time to watch the USA game and we MISSED the Argentina goal in over-time! 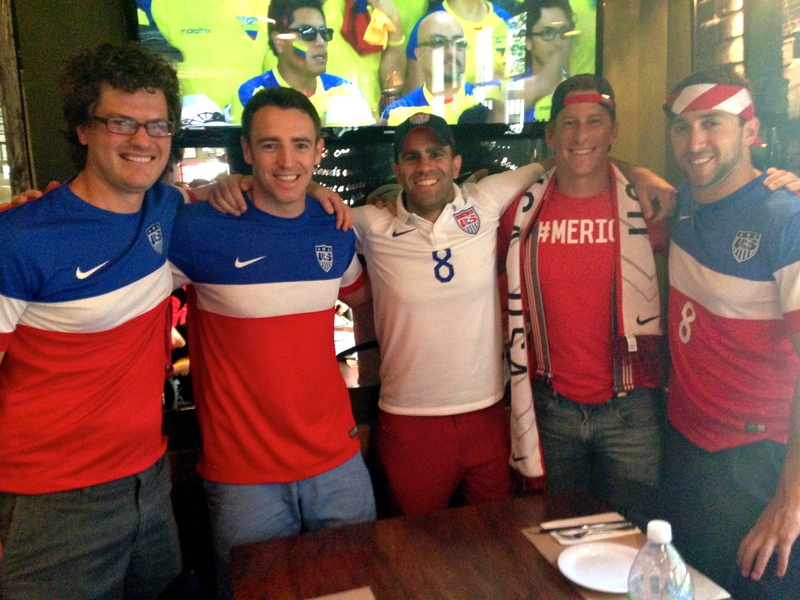 The even sadder part is that later that day, despite Tim Howard’s heroic efforts, the US was knocked out by Belgium. 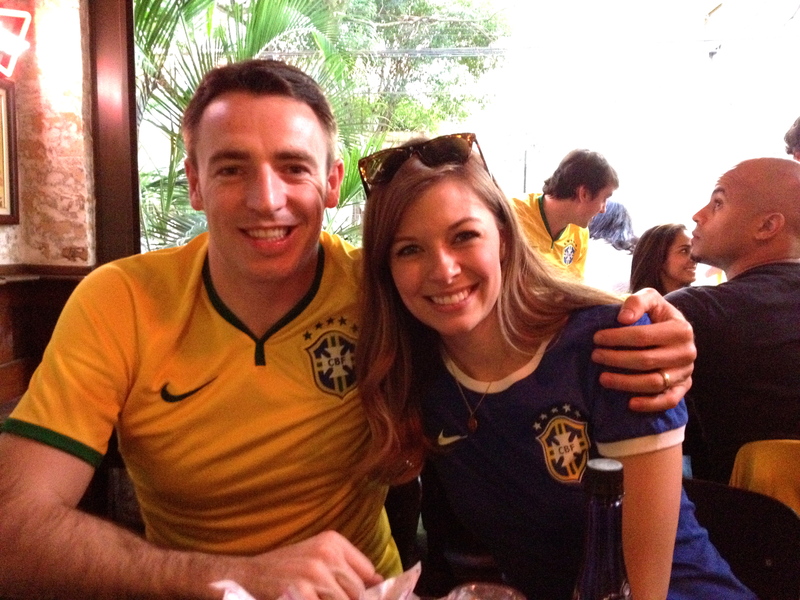 Thankful that we still had Brazil to cheer for, we channeled all of our energy there. This, as everyone knows, ended in quite severe heartbreak for the entire country as we took a crushing 7-1 loss to Germany. 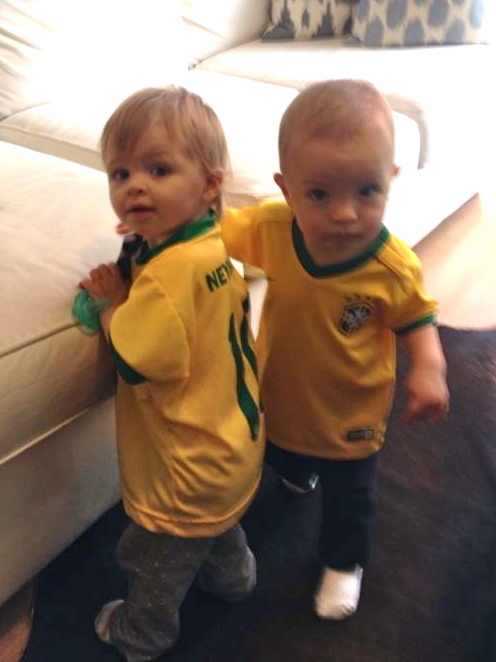 Our Brazilian babies hanging with the babysitter while their parents watched the game at a bar! Somehow they were not phased by the loss. 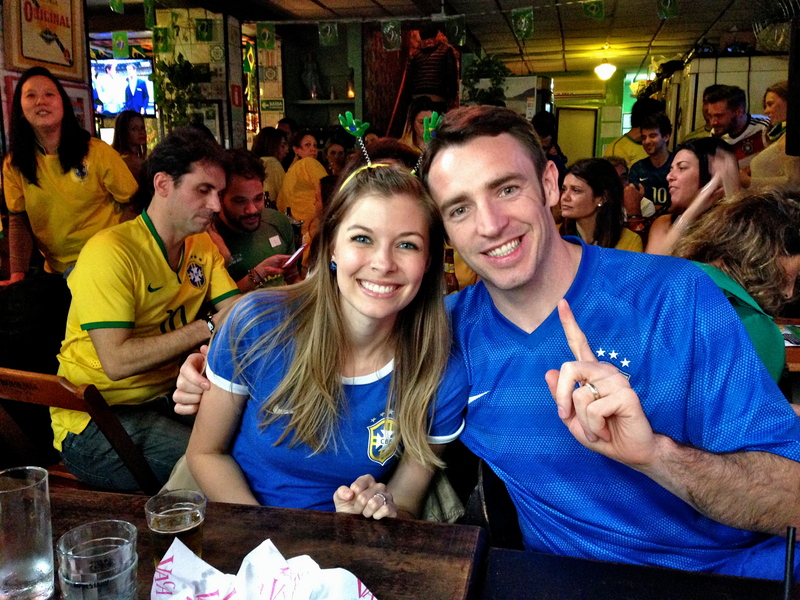 Once the US and Brazil were both out of the tournament, our enthusiasm levels went down a bit, but we still watched Brazil compete in their final match to come in 4th and then we watched Germany defeat Argentina for the title. To be honest, it was kind of an exhausting month, but it was incredibly exciting and truly unforgettable. So thankful we got to be here and be a part of it! 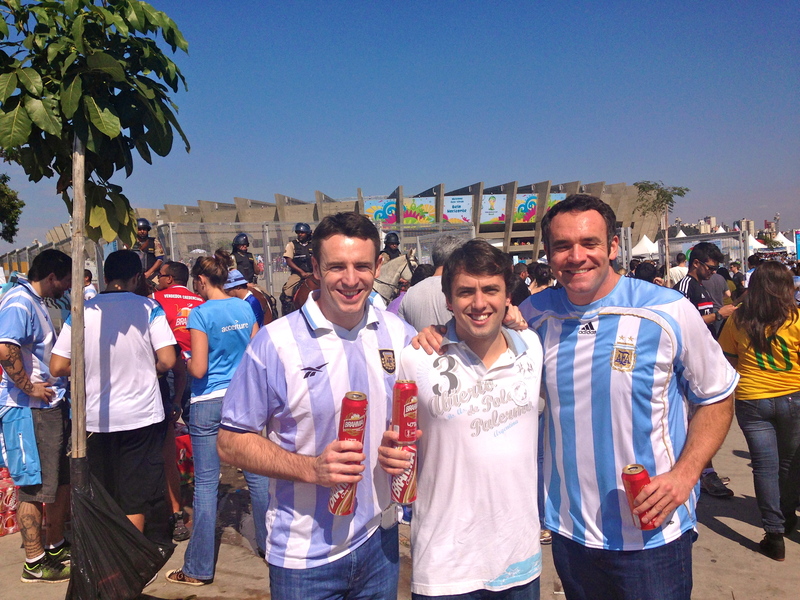 The weekend of June 21, Michael and Joe and their friends Trent and Tom flew to Belo Horizonte to attend Argentina’s game against Iran. Since Michael’s love for Latin America and soccer began in Argentina, he was super fired up to be going to one of their games. Plus, who doesn’t want to watch Messi on the big stage? Michael, Tom & Joe at the Minerão. 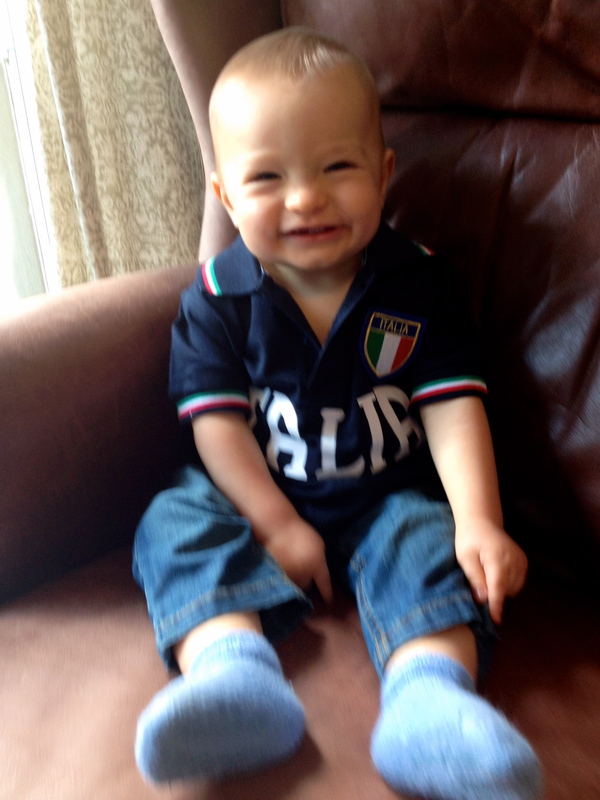 Michael sporting the jersey that was lovingly gifted to him from his Argentina besties, Pepe and Claudio. 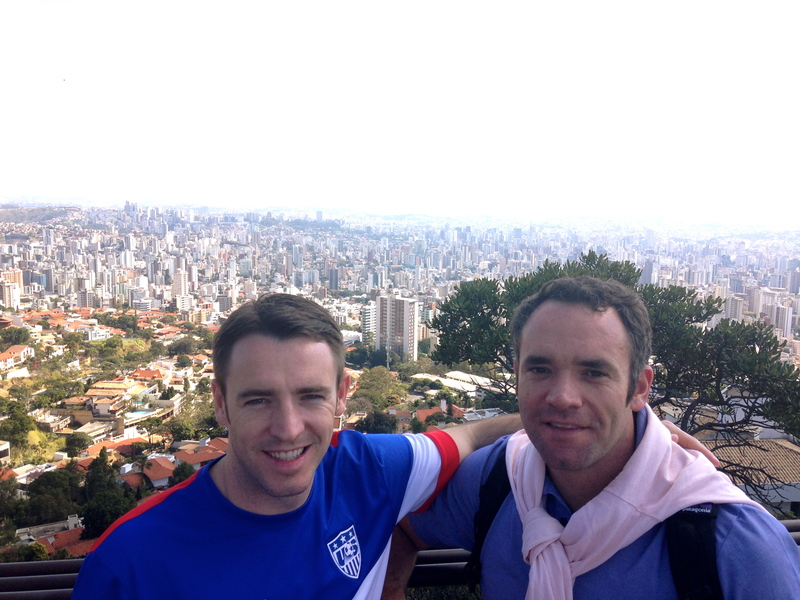 That weekend was also the USA’s game vs. Portugal and unfortunately, Michael’s flight wasn’t arriving in São Paulo until late Sunday night so he and Joe rocked their USA gear and watched the game from BH. Michael & Joe in Belo Horizonte. 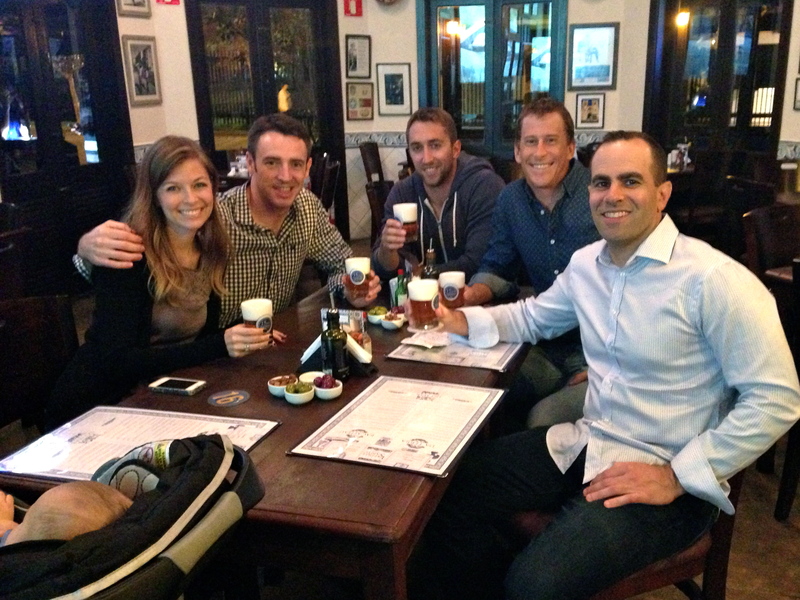 Back in São Paulo, gringo-nation headed to Casa Hudson for a fun and patriotic viewing experience. 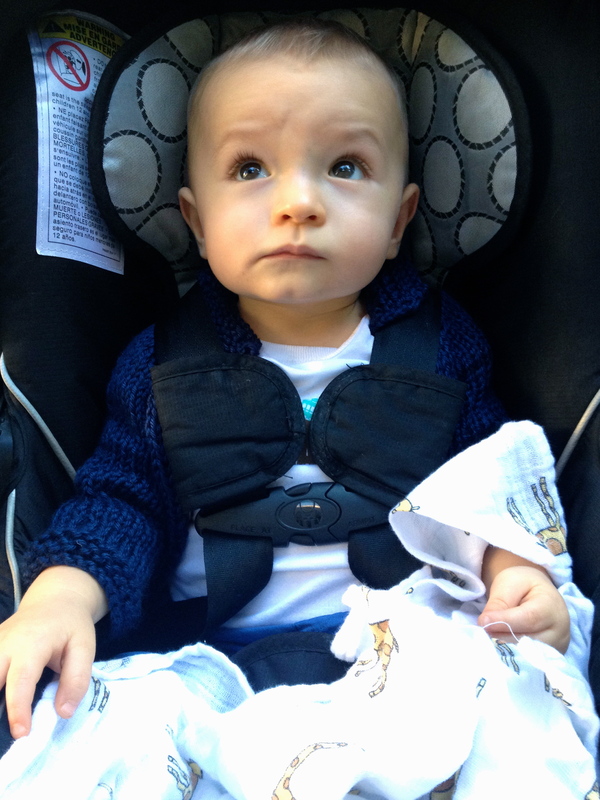 Colt & I on our way out! 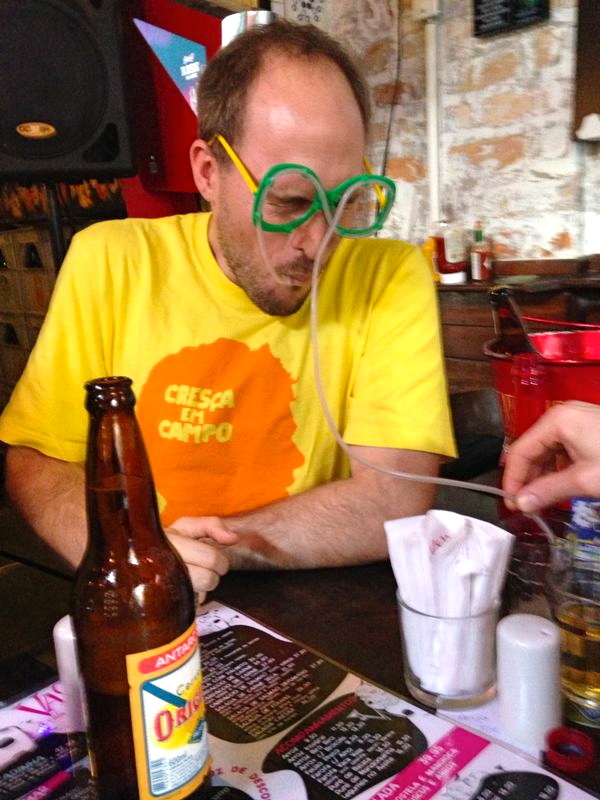 Our team played awesome and it was SOUL CRUSHING when Portugal scored to tie in the last minute of extra time, but we still gladly took the point and started prepping for Germany. 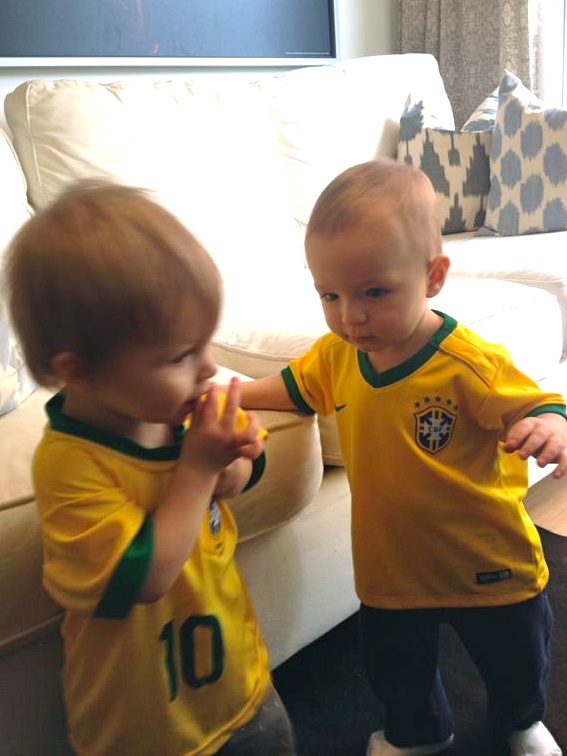 But, before we could cheer for the US again, we had to throw on our Brazil jerseys and cross all of our fingers and toes that they would triumph over Cameroon. By this point, they were pretty sure to advance out of the group stage, but Michael and I NEEDED them to WIN their group since we had tickets to the game of the winner! 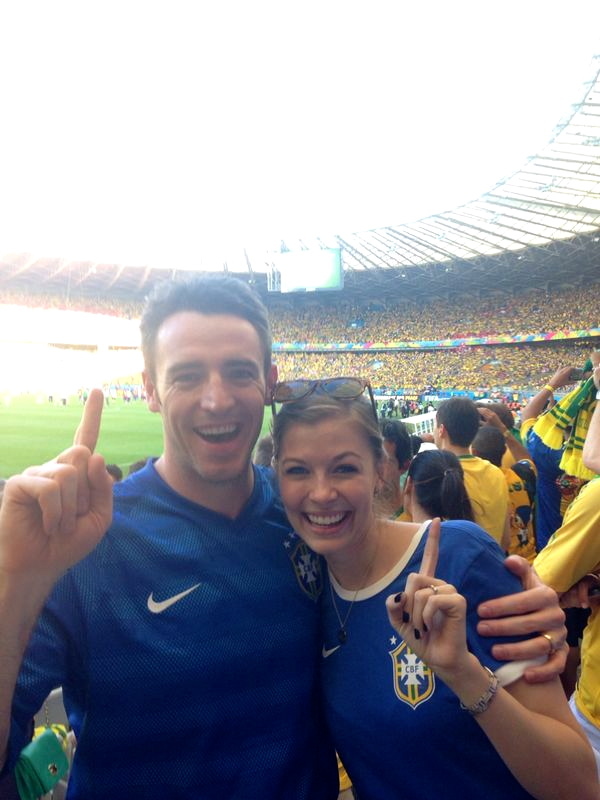 So we headed to the best spot to watch Brazil play, cheered our little hearts out, and were ELATED when they won!!! Vai Brasil from Vaca Veia! Trent making sure that he has his hands free to cheer! 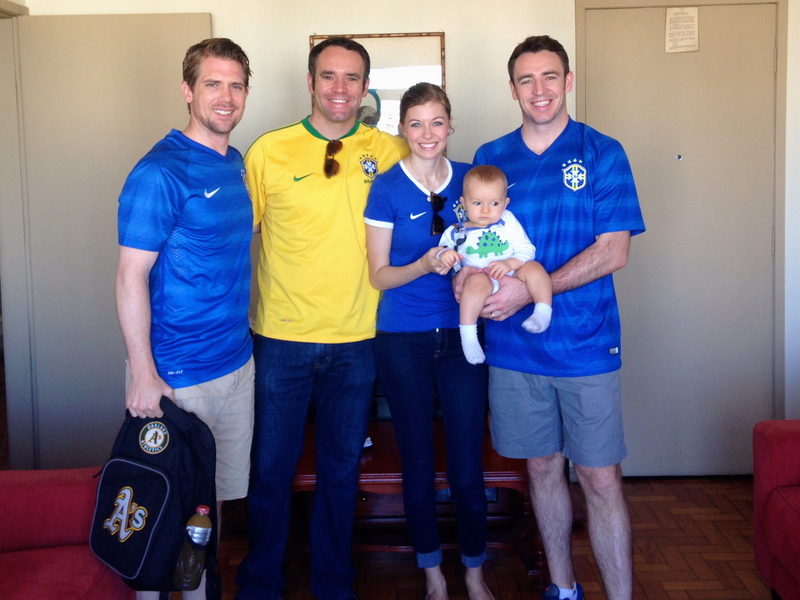 The next day, the Harper household was taken over by some lovely Chicago boys as Michael’s college buddy Mark and 2 of his friends visited for the World Cup. Welcome dinner at Espirito Santo. 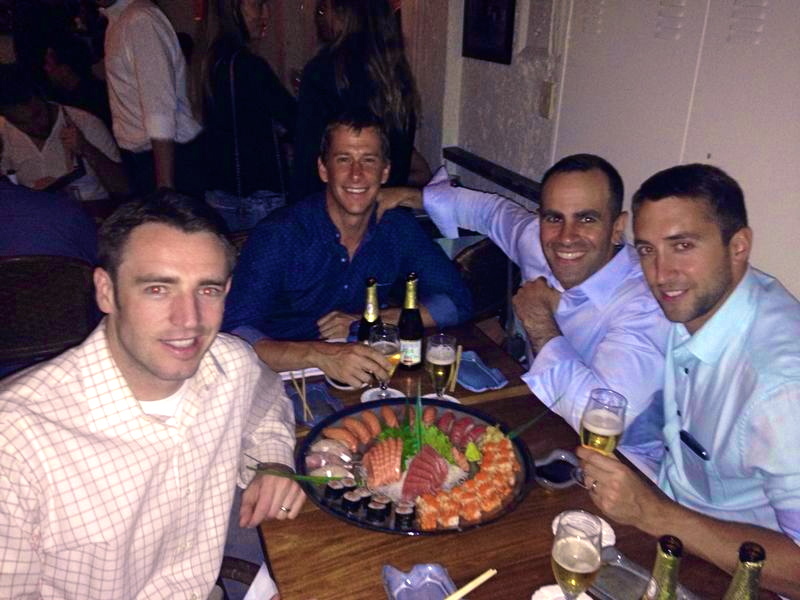 The boys out for sushi! 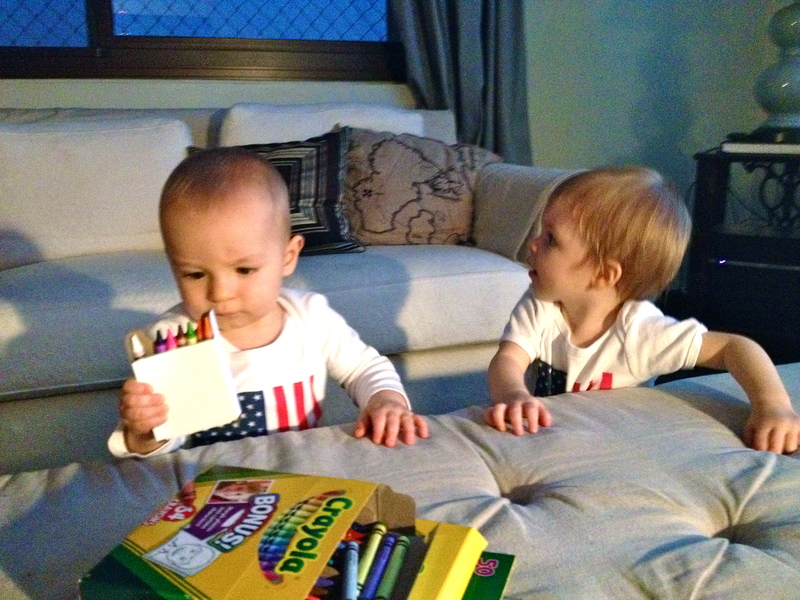 Meanwhile, Colt was cheering on Italy and couldn’t believe that they didn’t advance out of their group! 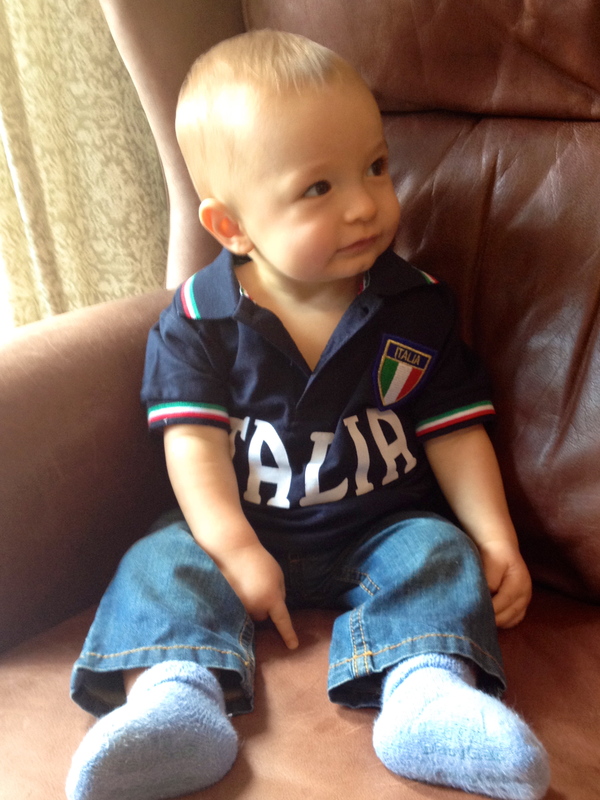 The cutest Italy fan! Sporting a jersey gifted to him by Michael’s coworker Artur! …Part 3 coming up next…!